For a person who "doesn’t like roses," I sure have a lot of them. Twenty years ago, I disdained all roses because all I knew were the over-bred hybrid tea types that were so popular from the late 19th century until about 20 years ago. Bred for the cut flower industry, these roses thrust up perfectly shaped blossoms on long, stout stems required for long-stemmed rose bouquets by the floral industry. (Read all about the complexities of the floral industry and its effect on plants and people in Amy Stewart’s book Flower Confidential.) But with their stiff, awkward form, they aren’t well suited to a garden setting, and the foliage is prone to the fungal disease black spot, which soon defoliates a susceptible rosebush in a wet Portland spring. But my prejudices towards the whole genus Rosa were unfounded: I was just ignorant of the possibilities. I can thank Heirloom Old Garden Roses for turning me on to legendary fragrant old-fashioned roses with a bountiful, arching habit; rambling climbers that you can send up a large tree (thereby creating a "rose tree"); and all variety of interesting roses whose best assets are not flowers at all, but stunning foliage, decorative thorns or lusciously plump, orange or red hips in late summer to winter. The rose world was much bigger and more interesting than I knew. These days, it’s a snap to find roses with spectacular foliage or remarkable, ornamental thorns. Most small nurseries that sell shrubs offer a selection of disease-resistant roses for foliage and flowers. My favorite single-flowered shrub rose is Rosa x odorata ‘Mutabilis’. Also known as Rosa chinensis ‘Mutabilis’, this is one of the most dramatic of garden roses, with single, tissue-paper blossoms that are dark peach in bud, opening to apricot, shifting to peachy yellow and finally, turning hot pink before dropping. The foliage is robust and disease-free, with a blue-green cast, and dark burgundy to smoky purple new stems that set off the flowers. 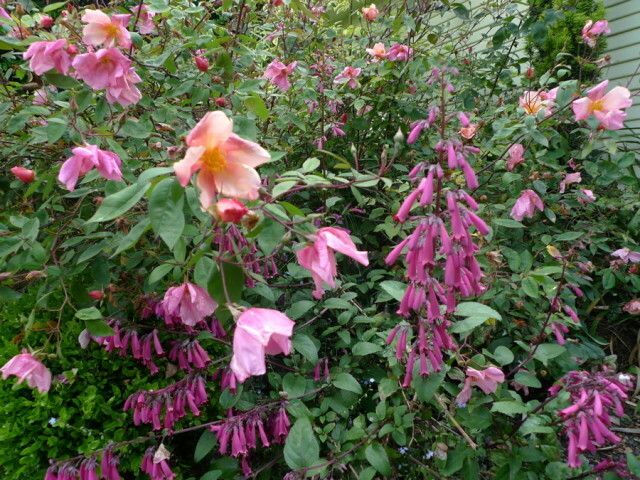 In my garden, the shrub is about 5 feet tall and wide but it has a more compact form in full sun. A small climber with a constant supply of wildly fragrant single white flowers all season. Big (4" diameter), single flowers open orange-tinted pale yellow, shifting to hot pinky-orange – almost electric! – as they age. The shrub reaches some 6’ tall and wide. Tough and beautiful at the same time, this 8-12’ tall shrub rose has smoky bluish-purple foliage and small, single pink flowers followed in fall by orange-red hips. An extraordinary shrub rose famous for its huge, wide, garnet red thorns that create a stunning show in winter after foliage drops. The single white flowers are pretty but the large, urn-shaped, burnished red hips appearing in fall produce a whole new show. About 8’ tall and 6’ wide. A big, lusty shrub with large, single red flowers, bluish foliage and flagon-shaped red hips. 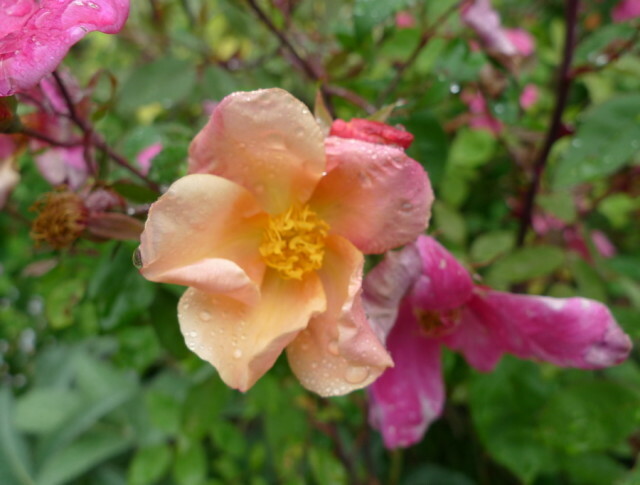 Xera plants’ own introduction of our most ornamental native rose. This one has very dark pink, fragrant single flowers and nice dark burgundy stems and showy red hips. The plants reach about 5×5′.